THIS AGREEMENT sets forth the terms under which we, Perillo Tours, Inc. d/b/a – “Perillo Tours” or “ItalyVacations” or “Learning Journeys” agrees to provide you with the services and accommodations for your escorted tour or independent vacation. (This contract does not apply to groups traveling on a one-time, customized itinerary). RESERVATIONS AND PAYMENT . Receipt of a deposit of $350 per person, and signed contract (electronic signature or hand-signed) is required to hold your reservation. The balance is due 60 days before departure. For bookings made within 30 days of departure, payment must be made by certified bank check or credit cards. For bookings made within 21 days of departure, you will be charged the cost of sending documents by express mail. PRICES . All prices are subject to increase up to the receipt of final payment due to any increase in our costs, such as, but not limited to: increases in air, land or sea fares, fuel cost, and currency fluctuations. All taxes, fuel surcharges, security charges and any other taxes or charges imposed by airlines, airports, cruise lines, governments, etc. are not included in price. After final payment the only price increases can be for newly imposed governmental taxes. Gratuities not specifically mentioned are excluded. FINAL DOCUMENTS REVIEW . While Perillo Tours takes the utmost care in making sure the information on your itinerary and travel vouchers (collectively, “Final Documents”) is complete and accurate, it is your responsibility to carefully read and review the final documents upon receipt. Failure to contact us in time to allow for the correction and re-sending of the final documents could result in the loss or cancellation of your reservation, tickets or services listed on the documents for which Perillo Tours will not be responsible. In such a case, no refunds will be possible. UNUSED TOUR ELEMENTS . No refund will be given for any unused tour features, whether because of customer’s choice, operational reasons, because of bad weather or any other reason. ERRORS . In case of printing, typographical error, computer error, verbal or human billing error, we reserve the right to invoice or re-invoice participants with corrected billing. BAGGAGE . Each escorted and independent tour member is limited to one large suitcase and one small carry on due to limited baggage area on buses. For some airlines and taxi/coach transfers, extra luggage may be subject to an extra charge due on the spot. NAMES MUST MATCH PASSPORT! The name given on your Perillo Tours booking must match the name on your passport, and in-turn, the name on your air ticket. Any variation between the spelling of your name on your air-ticket and passport will require re-ticketing, often at the cost of a completely new ticket. FEES FOR AIR-TICKET NAME CHANGES/REVISIONS/CANCELLATIONS . Name corrections before ticketing will incur a minimum fee of $50 per passenger, and are subject to fare, and or flight schedule changes. Once air tickets are issued, a minimum $300 revision/cancellation fee will apply to each ticket, plus fare, and or flight changes if applicable. This charge is subject to change . FEES FOR TRAIN TICKETS REVISIONS/CANCELLATIONS . Train tickets are not changeable and not refundable at any time. Any change to a train date, schedule or route will require the purchase of a completely new ticket. FEES FOR CUSTOMIZED ITINERARY CHANGES. After your initial deposit, a $150 administrative fee per booking will be applied for any change of service within your itinerary. These services include, but are not limited to changes of travel dates or number of passengers, and changes or cancellations of transfers, hotels, villas, day tours and reservations or services of any kind. After your final payment (60 days prior to start of services), a $50 fee will be imposed for each change of service within your itinerary. These services include, but are not limited to changes or cancellations of transfers, hotels, villas, day tours and reservations or services of any kind. There is no additional charge for adding services to your itinerary at any time. No changes are permitted 14 days prior to travel. Once you are in Italy, if you decide to cancel any component of your land reservation, there will be no refund for the unused service. Should you need to make a change to your reservation, you are required to purchase a new service at full price and forfeit the cost of the unused service. Air and train ticket changes and cancellations carry different fees as shown above. FEES FOR LATE BOOKINGS . Escorted tour and custom-independent bookings made within 30 days of the start of services will be assessed an extra $100 handling fee. FEES FOR CANCELED LAND SERVICES . If you cancel your complete land reservation, the cancellation charges shown below will apply. Cancellation charges are based on the number of days from the time Perillo Tours, ItalyVacations or Learning Journeys is notified of your cancellation, to the start of the services provided - whether air and land or just land services. TRAVEL PROTECTION PLAN Perillo Tours recommends you purchase a travel protection plan to help protect you and your travel investment against the unexpected. Travel protection plans can include coverage for Trip Cancellation, Trip Interruption, Emergency Medical and Emergency Evacuation/Repatriation, Trip Delay, Baggage Delay and more. To view your state specific Policy, Click Here. Contact Travelex Insurance Services at 1-844-204-0946 and reference location number 30-0335. If you purchased the Travel Guard Protection Plan prior to January 1, 2019, Click here to view your policy and product information. VILLA RENTALS IN ITALY . Very rarely, a villa Perillo Tours has reserved for you will be canceled by the owner. In this case, a similar or a better property will be offered to you. If the new villa is at a lower rate, the difference will be refunded to you. If the new villa is at a higher rate, Perillo Tours will pay the difference on your behalf. If no alternative villa is available, Perillo Tours will refund the total price of the booking and no further compensation will be due to you. Your villa rental payment to Perillo Tours includes the base rental cost plus the VAT tax. All extra charges, mentioned in each villa description, are not included in the rental price and are to be paid to the owner of the property or to their representative upon departure. These extra charges can include, security deposit, final cleaning service, heating/air conditioning or electricity. VILLA COMPLAINTS : The descriptions of the properties are made in good faith. Perillo Tours cannot be held responsible for changes carried out by the owner of the property without notifying Perillo Tours. Perillo Tours reserves the right to verify, during the period of occupancy, the reasons of the complaint of the client, if necessary by inspecting the property. If the complaint is accepted, the client will be compensated in proportion to the extent of the sustained damage (up to a maximum of the rental price). If necessary, Perillo Tours reserves the right to move the client to a similar or better property, based on availability. If the price of the alternative accommodation is lower than the price of the booked house, Perillo Tours will refund the client the difference. If the price of the alternative accommodation is higher than the price of the booked house, the difference will be paid by Perillo Tours. Should the client accept this exchange, no further compensation can be asked by the client. If no property is available to move the client, Perillo Tours will refund the total rental. In no case Perillo Tours will pay hotel or other accommodation costs. If a client leaves a property without giving Perillo Tours representative the possibility of verifying the reason of complaint, the client loses the right to any compensation. If a client complaints when he/she is no longer on the rented property, he/she loses the right to any compensation. Perillo Tours will not accept as causes for complaint weather conditions, stings or presence of insects, lack of water or electricity, work in progress, etc., if these depend on state-run organizations. Perillo Tours villa properties are not hotels but private homes. Their equipment, furniture and characteristics reflect the local style, the taste of the owner and the Italian traditions (ex. : normally the coffee machine is the Italian espresso maker and not the electrical machine) do not reflect the standard grading used by hotels. Therefore Perillo Tours will not consider these elements as a cause of complaint. HOTEL OVERBOOKINGS ON INDEPENDENT TRAVEL . In very rare cases, and through no fault of Perillo Tours, your reserved hotel may be overbooked upon your arrival. The overbooked hotel will offer you a similar or superior accommodation at no extra charge. If the alternate accommodation is not accepted by you, Perillo Tours reserves the right to offer you a full refund of such accommodation without rebooking. REFUNDS & COMPLAINTS . We work around-the-clock to insure your vacation goes smoothly and according to plan. But unexpected problems, often out of our control, can still arise. We urge you to work with us in correcting the problem on the spot instead of dealing with it after you return home. On Perillo’s escorted tours, work with your tour leader to resolve concerns. For independent travel, speak to your hotel front desk manager, your local tour guide, driver, etc. Your travel documents will also have contact numbers for help in resolving problems. GUESTS NEEDING SPECIAL ASSISTANCE . We regret that we cannot provide individual assistance to a tour member for walking, dining, getting on and off motor coaches and other transportation vehicles, or other personal needs. Travelers who need such assistance must be accompanied by a qualified companion. OPTIONAL TOURS . Traditionally, tour directors make available for purchase a series of optional excursions and other activities to fill in free days and evenings. You are under no obligation to take any; they are strictly optional. Depending on the tour, if you avail yourself of all optionals, the total will be approximately $200 to $600 per person. SINGLE ROOMS . Be aware that single rooms in Europe are often smaller than double rooms. Ask about a “double room/single use” option at a cost above the normal single supplement. TRIPLE ROOMS . Available on most tours. They usually consist of a twin bedded room with an additional folding bed or cot for the third person. This may not be comfortable for three adults. ESCORTED TOUR ITINERARY CHANGES . 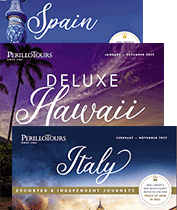 Perillo Tours reserves the right to change the scheduled escorted tour itinerary or trip features at any time and for any reason, with or without notice and/or to substitute airlines, hotels or features of a similar category for those listed in this brochure. Perillo Tours shall not be liable for any such changes. ESCORTED TOUR CANCELLATIONS BY PERILLO TOURS . From time-to-time a tour departure may be cancelled for lack of participation or other operational reasons. In such a case, Perillo Tours’ sole responsibility is to provide a complete refund of monies received without any other liability whatsoever including any additional costs or fees related to cancellation of airline tickets or other travel reservations not made by Perillo Tours. MISCELLANEOUS . Foreign air-conditioning systems in public places, hotels and motor coaches are not up to U.S. standards. If due to weather, flight schedules or other uncontrollable factors, you are required to spend an additional night(s), you will be responsible for your own hotel, transfers and meal costs. The right is reserved to decline, to accept or retain any person as a member of these trips at any time. In any such event, Perillo Tour’s sole obligation is to refund for any unused accommodations or other trip features. Passenger certifies not to have any mental, physical or other condition or disability that would create a hazard for himself/herself or other passengers. RESPONSIBILITY . Perillo Tours, Inc., Perillo Tours, ItalyVacations and/ or Learning Journeys, its and their employees, shareholders, officers, and directors (collectively, “Perillo”) does not own or operate any entity which is to or does provide goods or services for your trip, including, for example, lodging facilities, transportation companies, guides or trip leaders, food service providers, equipment suppliers, ground operators, etc., including, without limitation, various entities which may utilize the Perillo name. Perillo Tours is not responsible for any negligent or willful act or failure to act of any such person or entity, nor for any act or inaction of any other third party not under its control. Without limitation Perillo Tours is not liable for any direct, indirect, consequential, or incidental damage, injury, death, loss, accident, delay, inconvenience, or irregularity of any kind which may be occasioned by reason of any act or omission beyond its control, including, without limitation, any willful or negligent act, failure to act, breach of contract of any third party, such as an airline, train, hotel, restaurant, or food supplier; bus, taxi, van, or local ground handler; local outfitter or guide, which is, to, or does supply any goods or services for this trip. Perillo Tours is not responsible for any loss, injury, death, or inconvenience due to delay or changes in schedule or failure of any transportation mechanism to arrive or depart safely; overbooking or downgrading of accommodations; insolvency or default of any third party; acts of government; bites or attacks by animals, insects or pests; sickness; the lack of appropriate medical care; evacuation to same, if necessary; weather; strikes; acts of God; acts of terrorism or the threat thereof; events of force majeure; war; quarantine; epidemics or the threat thereof; criminal activity; or any other cause beyond its control. BINDING ARBITRATION . I agree that any dispute concerning, relating, or referring to these Terms and Conditions, this release, the catalog, or any other literature concerning my trip, or the trip itself shall be resolved exclusively by binding arbitration according to the then existing commercial rules of the American Arbitration Association in New Jersey. Such proceedings will be governed by substantive New Jersey law. The arbitrator and not any federal, state, or local court or agency shall have exclusive authority to resolve any dispute relating to the interpretation, applicability, enforceability, conscionability, or formation of this contract, including but not limited to any claim that all or part of this contract is void or voidable. Upon payment of a deposit, tour participant indicates acceptance of the above Terms and Conditions and of the Arbitration Agreement.